Good realization. I think Walker et al. demonstrated one aspect of that back in 1981 (the carbonate-silicate cycle), and of course Urey was thinking about in in 1952 (think “Urey reaction”), and the basic realization that the atmosphere and oceans are coupled to the solid planet goes back way before that. Like to the 18th century or so. I don’t understand the objection to use of Aerosols to counteract global warming. If the model is good for prediction, it is good for control. Why should there be more uncertainty in putting aerosols into the atmosphere than there is in putting CO2? We have results from several volcanic “experiments” on the effect of aerosols.. They are right. Supposing you could design organisms that could fix more carbon than current phytoplankton and compete successfully with the latter (which I doubt), you would be fundamentally disrupting marine ecosystems, with completely unknown and probably unknowable (in advance) consequences. One possibility is that your engineered organisms would drive most other phytoplankton to extinction, then fall victim to a virus mutated to infect them, leaving the sea largely devoid of life, and unable to fix much carbon at all. 1) Environmental effects (acid rain). 2) Possibly, health effects, although these might be avoidable if injection is high enough in the atmosphere. 3) Does nothing to counteract ocean acidification, the other serious effect of increased CO2 levels. 4) Who decides how much, of what aerosols, and where to release them? If there are negative effects, who pays? All of the Branson/Virgin bashing reminds me that “No good deed goes unpunished”. My mom often said, usually to me, “If I gave you the moon, you’d want a red ribbon around it”. I’m thinking some of you with nothing good to say about Branson would benefit from her wisdom. Just to provide some perspective here, this isn’t Branson’s only effort to provide some help in solving the problem. Sir Richard Branson’s Virgin Atlantic is to conduct a trial using 13 of its planes which could cut aviation fuel use and slash carbon dioxide emissions. By towing its Boeing 747-400 aircraft to take-off areas at London airports during December it said it could save up to two tonnes of fuel per flight. Aircraft will be towed to Heathrow and Gatwick runways to cut fuel burning. Virgin said a reduction of 120,000 tonnes in carbon emissions a year could be made if extended across its fleet. Passengers on Virgin Atlantic flights will be able to offset the carbon emissions from their journey from next year by paying a little extra toward green initiatives that absorb carbon dioxide, lower fuel usage, or provide fuel from green sources. Branson’s putting his money where his mouth is. Good for him. If he wasn’t an expert at self-promotion, there wouldn’t be any money for any of his activities. Re #91: Alex, thanks for noticing my comment (#9). I’m not a scientist – are there any specific laws of physics you believe my idea (carbon-ball-making GMOs floating on the ocean, then sinking) would violate ? I don’t mean ‘we do not have the technology to do do that now’, I mean a reason that idea violates, say, the second law of thermodynamics. After all, if a tree can make a grapefruit, how dissimilar is this idea ? Re #97: Brad, you seem to thinking along similar lines. What did the governments and scientists tell you was ‘risky’ ? Just the whole idea of a genetically modified organism, or something else ? (Seems like the ‘riskiness’ of a solution should be evaluated against failure to solve the problem). Err, no. Reforestation, no-till farming, etc. are only very partial solutions in terms of the mass of CO2 we’re projected to emit by burning fossil fuel. IIRC, we’re talking about maybe 3% of emissions to the year 2100 being able to be off-set by reforestation and no-till farming. I have the feeling people don’t have a good sense of the scale of the emissions. Google Socolow’s “stabilization wedges” article to get a decent background on the issue. There’s been work on accelerating the weathering of serpentine (Mg/Ca silicates) to carbonates as a method of sequestering, but again, this is an awkward and expensive technology compared to other alternatives. Hmmm, that’s puzzling: the hindered amines developed by e.g. Mitsubishi Heavy Industries regenerate at pretty low temperatures, so that the actual mechanical efficiency loss is quite a bit lower than that protrayed in the flyer. Ammonia absorption chillers operate real cheaply though. It may be that the use of chilled ammonia solution obviates the compression energy needed to chill and liquify the CO2 for sequestration. Hmmm, that’s puzzling: the hindered amines developed by e.g. Mitsubishi Heavy Industries regenerate at pretty low temperatures, so that the actual mechanical efficiency loss is quite a bit lower than that protrayed in the flyer. I understand the amine approaches suffer from chemical degradation problems; ammonia is cheaper and more robust. Degradation would be particularly problematic as the amine molecules used become more complex and expensive. Great new about electric cars: Tesla to make a 4-door sedan by 2009. Unlike their beautiful $92,000 electric sports car, this one will cost about $50,00 and seat 5. It’s beginning to come within my reach. Just slash that price in half & I’ll be ready (tho I’ll still have to extremely convince my husband with a cost/benefit chart). The price per mile is about 2 cents, I think, and the lithium ion batteries give full performance for the first 100,000 miles, then diminish (with our under 4,000 per year driving, it would be a long time before replacement, and the price should go down). Most of all, since my electricity is 100% wind generated from GreenMountain.com we’d be driving on the wind. See http://www.tesla.com for info on their sports car. And BTW, electric cars were one of the 1st cars to be made; ladies preferred them bec they didn’t have to be cranked to start. But the automatic ignition (& better range) made ICE cars a better deal….and the rest is history. Sorry, I hit the wrong button and an unready version of this posting went in. Does anyone happen to know the delta ‘G’ for this, the magnesium-serpentinite process? “Accelerating the weathering” is an odd way of saying “run the serpentinite through an ore crusher”. Per tonne CO2 made solid in the above process there needs to be crushed 2.28 tonnes of MgSiO3 serpentinite; if the degree of comminution must be such that 80 percent of the fragments’ sizes are 0.025 mm or less, this takes 114 kWh of electricity, 14 percent of the amount that a power station burning pure carbon would produce per tonne of CO2 emitted, or a smaller fraction if the fuel is a hydrocarbon. I see the NIST database has the carbonate and the silicate, allowing a delta ‘G’ to be calculated: -28.15 kJ/mol. on a windy day been looked at? Pete, why are you trying to tell us we can’t do it, just watch us. To suggest we need that money to spend on roads and healthcare is just breathtaking! We don’t need to spend it on roads, cause higher fuel prices will reduce traffic, and we will save on healthcare costs by tackling CC. Why should we wait any longer, for anyone else, we have been waiting for years! I am 100% behind the EU. It is great to see some genuinely substansive commitments, i am delighted! actually the unilateral EU cut is only 20%, its 30% if anyone will join with us. Apparently Germany offered 40% if others did the same! Isn’t serpentine a fancy-schmancy building stone? the kind of thing you build banks with? Crushing a couple billion tons of serpentine to sequester CO2 just doesn’t sound like it’s gonna happen. Re:#65 by James. He is on the right track, but ocean thermal energy conversion (OTEC) has been under development for more that 100 years and still no real operating plants. These were all efforts to export electric power or ammonia etc. By putting all the power into pumping cold bottom water and warm surface water, and pumping all this water through the condenser and evaporator heat exchangers, we can increase the thermal efficiency enough to make OTEC work. Just export cold water and nutrients. The solution to reinvigorating our atmosphere is twofold and involves seldomly used thinking called common sense. The first is to eliminate automobile oil comsumption and use farmland materials as derivatives for fuel. The second is to create a global imperative to plant trees and shrubs in massive quantities. The planet will be saved (for now), humankind’s overall health will improve, American farmers will get their just due, Terror states will hate you, and animals will love you! Now where’s that $25 million? Jeffrey: serpentine is actually usually fairly soft (hardness 2.4-4) as rocks go. Crushing it isn’t the biggest problem; reacting it with CO2 sufficiently quickly is. As far as I know, noone has yet fully solved that problem. Has crushing serpentinite and then just blowing it out a tall stack on a windy day been looked at? I suspect dispersing it in the ocean would be a better bet, if the particles are sufficiently small. Even so, the dissolution rate at ocean pH wouldn’t be very high. You’d also have to worry about heavy metal pollution — ultramafic minerals like this often have high levels of nickel (in the rough neighborhood of 0.1%, IIRC). All that iron would also have its effect. One might also consider using electrodialysis to break salt into alkali and acid, then neutralize the acid on the mineral. Less crushing would be required with strong acid. Release the alkali into ocean surface waters to increase pH, drawing down CO2 from the air. I suspect this uses too much energy, though. MgSiO3 is not serpentine (or the other commonly proposed mineral for carbonation, olivine). One can say that about any CO2-precipitating scheme. This one is much, much easier than the grow-plants-and-bury-them one. As it has come to me, the mineral name is serpentin-ite; there are adequately many cubic leagues of it. Or if not, I suppose the whole deal could be financed with the money found within the banks after they are crushed. 92: Anyhow can’t CO2 be removed the an alkaline metal solution? Presumably you mean removed with a solution of sodium or potassium hydroxide. The basic problem is to find a cheap source of alkalinity. This just in: The White House has issued Signing Statements waiving any obligation for its climate change proposals to obey the Laws of Thermodynamics and Conservation of Energy. Well . . . it is bound to happen. Robert Bell commented that one way to get excess carbon out of the atmosphere is to create a global imperative to plant trees and shrubs in massive quantities. Well hey, why not wrap that up and submit it? Sounds just fine to me! Apparently ocean fertilization is getting traction as an idea. Apparently it is not such a good idea. Here is my $25M idea. Everyone go vegetarian. Between the revegatation of cleared land for grazing and decrease in livestock, you’d probably net about a billion tonne of CO2 out of the atmosphere. re #53 (Lars: Save the planet, become a weedeater…..) and #76 (Lynn: If people could just cut their meat consumption in half, that would help,……) Boggles the mind. Sure seems like a stretch to help justify a life style…. re #86: …..feasible to actually remove CO2 from the air, is to plant trees. …..
A start might be to get Brazil and others to stop decimating agruably one of the largest carbon sinks around — the Amazon rain forest. Speaking of conservation of energy/thermodynamics etc #120, is it possible that the predicted future population of 9 billion will actually require the consequences of CO2 production and GW to survive. If our population growth is directly and indirectly attributable to the use of fossil fuels what will happen when our readily obtainable supplies of these fuels run short. Will we require this additional carbon to increase plant productivity (whilst using less water) to convert to energy as well as food production. Agriculture/forestry may prove to be the most effective solarpower capturer though not necessarily the most efficient. For an expanding population GW may be needed to create productivity from land currently too cold. It is said large parts of alaska could come under wheat production on fertile soils if temp increases to the upper end of IPCC prediction. Simplistic yes, but nature tends to have checks and balances. A conservation of energy in that to get to current population large amounts of stored enengy were released, those stores will soon be exhausted(realative to the amount of time it took to make) yet a population approaching 50% more has to be maintained. We can only guess for how long. No, Mark A York, I have no credentials so no point looking. Just go ahead and label me some sort of climate change criminal and continue to proffer no ideas of your own. re #90 I’m a skeptic (different from a denier, btw…) but agree totally that retorts about Branson’s airline or Gore’s use of private jets and limos is playground silly. You said it: [Simplistic yes]. Would that some of us had some of that. Re #125: I think hopes of increased agricultural production due to GW are pretty much wishful thinking. Though I’m no expert (just a gardener), your first clue would be to look at a globe rather than a Mercator projection. The land area that could come under cultivation due to warming is less than what would probably go out of production due to heat & drought. Second is that land that is cultivated (at least by conventional methods) stores quite a bit less carbon than if left with natural vegetation. If the land is currently forested this seems obvious, but even the mass of plants & sod in a prairie/grassland contains quite a bit of carbon. So the bottom line is that you have some part of current agricultural lands turning to desert, while converting northern forest & tundra to cropland would likely release more CO2, and make the problem worse. I would tend to agree with post# 128. Also to be considered are the geopolitical implications. Russia is not going to gracefully lease large swats of land to China just because the Yellow River is running low. Whatever advantage countries of a geographic region would gain over others because of GW changes are liable to bring tremendous tensions and few solutions. Given the fact that the global population will increase and the largest increases will take place in regions likely to be adversely affected, I would not rely on a nice hypothetical “check and balance” system. seems to favor increased production. I figured out how to reverse “Global Warming” and want Richard Branson/AlGore to hear and enter my idea for his prize. The idea can control the weather and weaken any landfalling hurricane prior to landfall. The idea protects the environment and will not harm it in any way. I worked as a control room operator in a fossil fuel plant for 20+ years at Florida Power and Light Corp. and now I work in the control room for the Anniston Army Depot in Alabama destroying Weapons of Mass destruction ( Mustard Gas, VX / GB nerve agents). the byproducts ( Stack Emissions ) the plants produce and the effects they have on the envirionment. My plan is a simple transfer of energy already stored in our Earths oceans which we are heating up. My idea restores those temperatures back to pre-industrial revolution temperatures. My biggest problem thus far is getting the idea computer modeled. Only a few computers can do it in three dimentions and I can not get access to them. Many scientist including hurricane specialists at the Hurricane Research and developement (HRD) think the idea is valid and needs futher study. Anyways, can you get this information out to Al Gore/Richard Branson to enter the contest??? Here are some interesting comments from some very famous scientists on the idea! It seems as though Pascal and Bernoulli were on the right track with their theories. If only they met each other they may have come up with this idea. It took me ten years to figure this out and as sure as their principles work on airplanes it will also work on these tunnels I propose! Recently, a European chemical research team (Elcat project*) found a way to convert directly carbon dioxide in hydrocarbon chains of 8 or 9 carbon through a catalytic reaction. They achieve the conversion in 15% yield and they hope to obtain higher yield by changing the reaction conditions and the nature of the catalyst and eventually an industrial process to produce fuel at a competitive price in a decade. For the moment, this would be difficult due to the low yield of the reaction and the cost of the catalysts (titanium, palladium, platinum). Secondly, an American team found a way to lengthen hydrocarbon chains by metathesis reactions. This could enable us to produce, with hydrocarbon chains produced by the first method, hydrocarbons such as kerosene. Preferably, these discoveries could enable us to remove the excess of carbon dioxide in the atmosphere by changing it into hydrocarbons. The best way to store this huge amount of hydrocarbons could be to put it into the empty oil reservoirs (globally, itâ? ?s rather stupidâ?¦) or into other geological traps. Of course, this would be possible only if there is a political will and a parallel effort to reduce the emissions and therefore the consumption of fossil fuels, especially coal consumption. As there are so many million dollars available, I think the prize or part of the prize should be given not after the presentation of a reliable project but before, to finance the research in this subject area. Indeed, the global budget of the four research teams involved in the Elcat project is relatively small. To achieve the goal of sequestration of carbon dioxide, the Elcat teams should be associated with the American chemistry team** which worked on the lengthening of hydrocarbons chains and with the engineers who can adapt the ASU to conceive the system which could remove the dioxide carbon, which is exposed in comment 57 (by Philippe Shaw). What do you think of the idea? At which level should the carbon dioxide concentration be lowered to retrieve rapidly the past climatic condition of the 20th century? I thank you for the attention you will give my comment and for your answer. UniversitÃ di Messina, Salita Sperone 31, Messina, Italy. (**) If you are interested, I can find the address of the American chemical research team. Several years ago, Livermore researchers were investigating the use of limestone for this purpose. CO2 from power plant flue gas would be bubbled through the limestone bed and the resulting dissolved calcium carbonate pumped into seawater. This would not result in an acidification of the ocean water and would be an environmentally friendly way, more or less to store carbon from fossil fuels in the oceans. Since the limestone is in abundant supply, there would be no need to manufacture more or to regenerate it. Problems with this include the slow dissolution of the limestone. I don’t know what the status of this research is now. Applying this concept to ambient air would be even less likely to succeed, since there the CO2 concentration is around 0.04% vs. around 10% in the flue gas. i recently read an idea that suggested “subliming” co2 from the atmosphere in siberia and storing it there in either liquid or solid form. the basic premise being that given the average temperature in siberia the cost to do this would be significantly reduced. can someone do a quick back-of-the-envelope calculation of the energy required? Their missive or missile titled “Gambling with Gaia,” paints a rather distressing and highly exaggerated picture of geoengineering efforts past, present and future, some of which would be candidates for the $5 million Virgin award. Much of the document obsesses on various field trials involving ocean fertilization, but also touches on genetic engineering and scattering of solar radiation. Several examples suffice to illustrate the unreality of their concerns. On page 2, they show a quote from president Bush in which he says that we should focus on technologies that deal with the issue of global warming. They then take this to mean that Bush is talking about geoengineering. On page 4, the Bush Administration’s two or three lines of comments suggesting that geoengineering ought to be considered among the technologies for addressing global warming in the third of this year’s IPCC reports is turned into “pushing for techno-fix strategies.” Given the level of interest the Administration has paid since 2001 to geoengineering, I would say they haven’t been pushing all that hard. On page 6, they conclude that stratospheric sulfate aerosol enhancement would result in massive particle pollution, failing to recognize that most of the tropospheric sulfate distribution occurs over about 5-10% of the Earth’s surface, while the stratospheric aerosol would be over 100% and in much lower quantities. On page 12, they manage to conflate the NASA meeting held last fall to discuss geoengineering technologies with the Bush Administration’s decision in 2005 to delete “to understand and protect our home planet” from its mission statement. The real reason that was done was to try to get back at James Hansen et al., by removing the need for funding climate monitoring satellites. Although it probably won’t help allay their concerns, tonight at 9pm and 1am and on March 4 at 4pm, the Discovery Channel’s Best Evidence series will include some discussion about the likelihood of geoengineering. Individuals of varying degrees of relevance and credibility will appear. You may even be familiar with some of them. I don’t know what the status of this research is now. IIRC, they have patents on it. One idea was to mix water, liquid CO2, and powdered limestone into a pressurized emulsion, and pump that into the deep ocean. The bulk density of the mixture is higher than that of liquid CO2 itself, so it can be released at shallower depth than pure liquid CO2. Tunnels generate 12 trillion joules of pure hydroelectric energy!!!! Who says this? Have you seen Alaska? Because turning a Boreal forest and thousands of square miles of muskeag, and swamp, which will stay swamp longer in warmer temps, to a midwesterm wheat field is quite a stretch to this former Alaskan. There are nice vegetable gardens grown in the long summer nights in minute areas like the Matanuska Valley, but no one will feed the planet from them. Ever. I suggest reducing CO2 output starting with the biggest violators: power generation. Install scrubbers. If cheap hybrids were around, used, I’d own one, but they’re exotic, expensive and generally not available. Make them so. Until then, I’ll drive my little Ford Ranger that gets 29 mpg. This is the best I can do at the moment. Crushing it isn’t the biggest problem; reacting it with CO2 sufficiently quickly is. How much quickness is considered necessary? I don’t know, but it directly affects the economics, since the capital cost of the reactor is related to its size, which depends on the residence time of the reactants. Here’s a twist for those who want to jump the gun and charge folks with criminal negligence. What if global warming ended up not being as catastrophic as the extreme alarmists claim. What if it turned out to be an overall benefit to the planet and mankind because no one can definitely predict all of the consequenses or benefits for the next 1000 years. Do the skeptics then get to launch a class action suite against the alarmists? Be very careful how you want to accelerate finger pointing about a scenario that has not been fully understood and can change scientific consensus with one massive solar annomoly or a new discovery. Look through history and you will find that consensus is really only the opinion of the day. Interesting topic, but keep in mind we don’t really know where the future CO2 emissions are going – expectations are for carbon-cycle feedbacks to reduce the amount of CO2 absorbed by the biosphere and the oceans, resulting in faster rates of CO2 accumulation in the atmosphere even if fossil fuel emissions don’t increase. The only long-term solution is to stop buring fossil fuels. Carbon capture and sequestration (two different stages) is certainly highly energy intensive – how much of the energy in the coal would be used to condense the CO2 to liquid state? Or even to separate it from the air and water? Imagine trying to capture all the CO2 that comes out of the tailpipe of your car…without plugging the thing or reducing flowrates. Imagine some device that produces black carbon pellets and doesn’t consume much energy – it’s just not too likely, and there is no technological fix in sight. The energy costs of carbon capture are unavoidable (30% of the total, or 50% ? I’ve seen no numbers, but since there’s no viable technology in place to test, that’s not surprising – and coal is already the most energy-poor fossil fuel). Apparently, the plan is to burn coal in air, use the energy, then use some of that energy to capture the CO2 produced – but to make it stable and storable, you’d have to use energy to convert it back to something rather like coal. You can’t pump CO2 into the oceans and it leaks out of old oil fields. Given these basic inescapable energy thermodynamics, I’d be very surprised to ever see a single coal-fired power plant that captured and sequestered its carbon output being built. There are those who disagree ( http://www.geotimes.org/mar03/feature_demonstrating.html ) but they have nothing very plausible to show for their efforts. “Clean coal” is just not possible. The entire planet is going to have to voluntarily stop burning coal and oil as energy supplies, and use the solar resource base for energy generation. There’s no shortage of potential; see http://www.solartoday.org/2006/mar_apr06/wake_up.htm for example. The only barriers are political and economic in nature (unlike the case for carbon sequestration). As far as the $25 million prize, the low tech version is to encourage reforestation over say, a thousand year period, and keep cutting down mature trees and burying them in airless bogs, deep stratified lakes, and other low-oxygen basins. This is simply reversing the process – a new round of organic carbon burial to make up for all the buried carbon we’ve pumped into the atmosphere. Maybe using some fast-growing plant species like sugarcane would be the best route. The high tech version would also be based on photosynthesis, and would involve making methane using water, sunlight and air (with ambient carbon dioxide) – but you’d probably want to store the methane and use it as fuel after going to all that trouble. It would at least be a carbon-neutral fuel, like other biofuels. Well how about Juliane Fry who did the next blog on Aerosols? Look at her CV – Re. Talks. And she looks like a baywatch babe in disguise. I await with interest Crichton and her on the Springer show. I know the Flat Earth Society applauds you. And, the remainder of your comment is written as if you are aproaching your last days and care nothing of the consequences of a global warming world for generations to come. [one massive solar annomoly or a new discovery] arrives. Because allowing CO2 to accumulate will acidify the oceans even if global warming is mitigated. As the world warms agricultural belts move toward the poles, which makes them smaller (area on a sphere is a 1 – sin theta curve where theta is latitude). Plus the expected droughts and violent weather along coasts will hurt agriculture as well. Agricultural production is expected to drop under global warming, not increase. 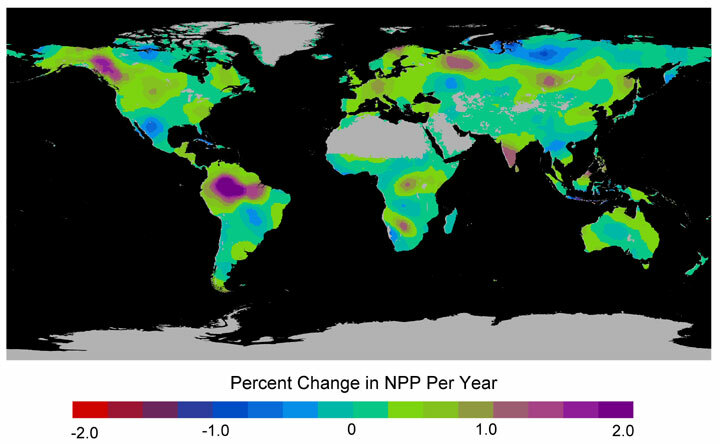 Are we talking the geobiophysical index, Net Primary Production, or agricultural production? Growing more plant life might help a bit, but our agriculture is still going to take a major hit due to droughts and violent weather. [[Here’s a twist for those who want to jump the gun and charge folks with criminal negligence. What if global warming ended up not being as catastrophic as the extreme alarmists claim. What if it turned out to be an overall benefit to the planet and mankind because no one can definitely predict all of the consequenses or benefits for the next 1000 years. Do the skeptics then get to launch a class action suite against the alarmists? Darn right! And if gravity some day turns out not to be true, I think we should be able to sue somebody when we all float out into space. The word “thermodynamic” in these comment threads seems usually to be part of a bluff; it means the writer wants to say that atmospheric CO2 capture won’t work but has no idea why it might not. Presumably a dramatic use of the word “entropy”, perhaps accompanied by a whipping-off of eyeglasses and a nailing of the monitor with an intent gaze, is the weapon still kept in reserve if tiresome people like me continue to point out that the delta ‘G’ of atmospheric CO2 capture is negative. If CO2-hungry mineral dust is dispersed from a tall stack, the reactor is all that part of the atmosphere in which the downwind plume is suspended, and maybe some desert ground on which it settles; this suggests quickness of reaction is not all that important.